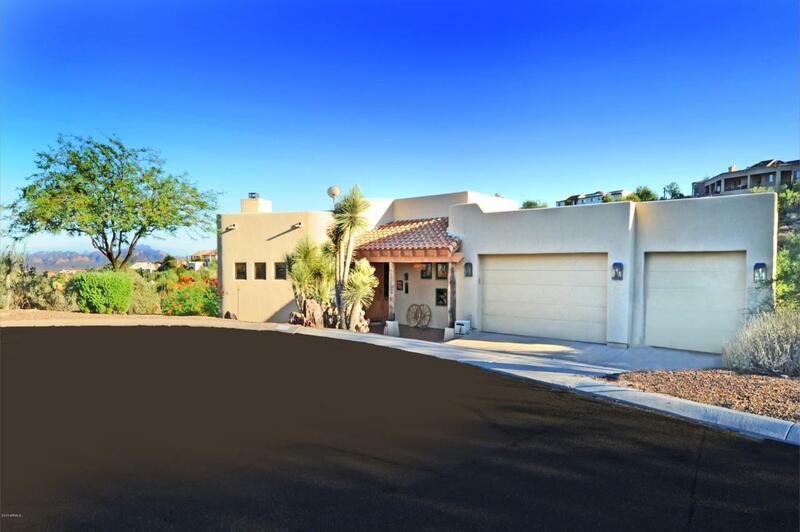 Beautiful territorial located on cul-de-sac with spectacular mountain views and borders a wash area. A portion of the lower level is air conditioned but not completely finished. Great room has Pella windows with built-in shades, large wall of sliders, wood floors, 55'' TV with surround sound, built-in Dolby 7.0 sound system and gas fireplace. Master on main level has electric fireplace and slider to balcony.Kitchen is equipped with flat burner cooktop, island with bar seating, and eating area. Home needs kitchen and bathroom updating and is priced accordingly. Seller put the money into the following updated items: New A/C units & air handlers 1/15 & 7/16, roof re-coated 2015, exterior elastomeric paint 2015, and interior painting 2015.